'For us, North Indians, who are habitual late comers and lackadaisical in our temple attire; who go to temples in jeans and shorts; who keep our temples dirty, where rotting flowers are strewn in the pathway -- Manipur teaches us grace and discipline,' says Tarun Vijay. Manipur is not just a subject of politics, terrorism and road blocks. Most often newspaper reports from the state only feature statements made by politicians or explosions conducted by terror groups -- making one wonder how its people must spend their daily life. 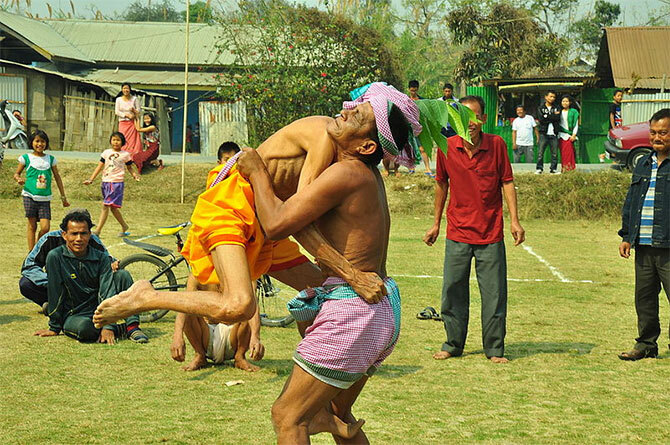 Manipuris are people with a great culture. They celebrate their festivals with such gaiety and colour that it could teach a lesson or two to those living in the north. Now that Najma Heptullah is governor and with Doordarshan's help in Delhi, I can hope Manipur's Holi will get some attention on television this year. For once, don't limit Holi to only the Barsane-ki-Lathhmaar and the carefully selected ugly scenes during Rang Panchami. The best and most civilised Holi celebration happens in Manipur. For once, let that also be reported and telecast live from Imphal. It will fill every Indian's heart with joy and pride. People should take the time to visit Manipur which is endowed with incredible natural beauty and continues to preserve Dharmic traditions. 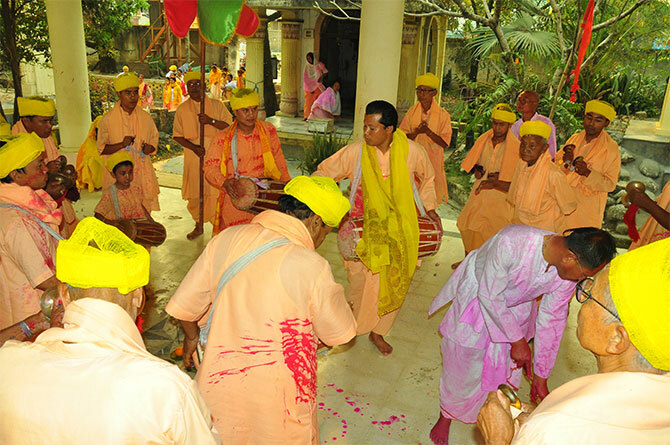 Holi is known as Yaosang in Manipur. It is celebrated for five days. On those days there is no traffic on the roads, shops and offices are closed, temples reverberate with Krishna bhajans and groups of men and women wear traditional Manipuri clothes. They go to the temple with pichkaaris and play Holi, first with Krishna's idol in Govindajee's temple and then with each other in the temple precincts. 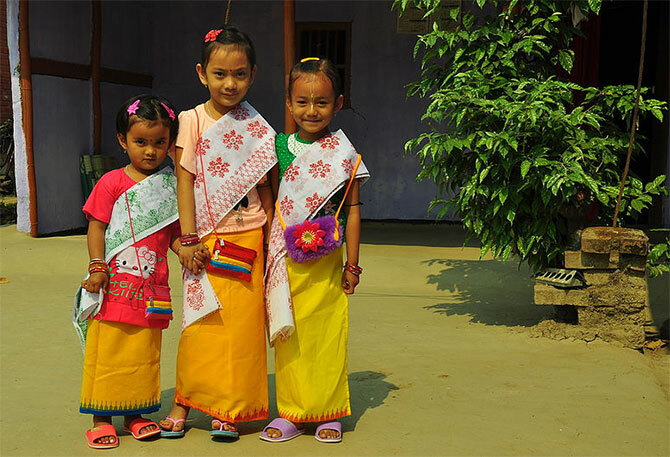 They then leave for their respective villages and visit the homes of friends and relatives, singing songs, celebrating the festival of colours. Families, rich or poor, visit each other. The young love receiving Holi money as part of the festivities. There are no rowdies or drunk people on the roads. I didn't see even one such incident or brawl during my three-day stay there. I heard beautiful Manipuri bhajans and Holi songs. Often young boys and girls ask for Holi funds from passersby. People happily give them any amount they can. It's like Lohri groups collecting money in Punjab. Not extortion, but a part of the fun. Sport is another important part of the festivities. 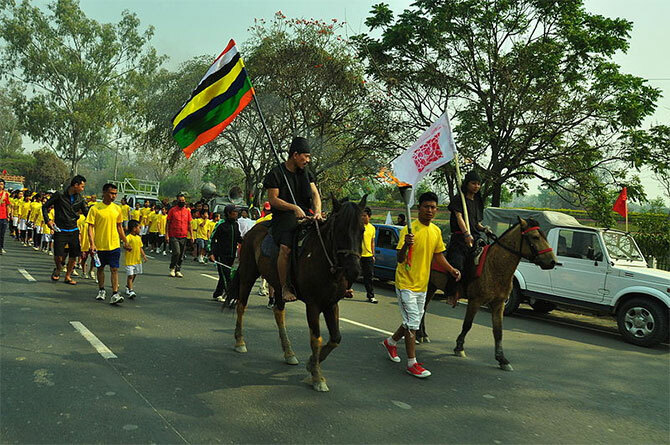 That's what makes Manipur the sports capital of India. Every street, mohalla, village, town has innumerable sports associations. From dawn to dusk, every one in the family, from the youngest to the oldest, comes out and takes part in the uninterrupted flow of the games. Men, women, children alike play balloon bursting to football, run various races and play Kho Kho. Hardly anyone eats at home. Every sports association and committee makes sure that food is served or sold at the venue. It is wonderful to see the entire city on the sports grounds, participating in Yaosang-Holi, winning awards like a pen or a book. The temples in Manipur serve as an example for other temple priests in India. They dutifully observe the time of each ritual and perform it with a grace that leaves devotees spellbound. If a puja is to begin at 12:20 pm, it will begin sharp at that time. Each ritual has a different attire for the priests and devotees as well. Those who cook food for Govindajee and the devotees wear different clothes -- clean and well ironed with traditional Manipuri turbans. The attire of those serving the food to the devotees is also different. The time is strictly adhered to -- 12:30 lunch means 12:30 and all can be seen sitting and starting the meal with the prasadam. For us, North Indians, who are habitual late comers and lackadaisical in our temple attire; who go to temples in jeans and shorts; who keep our temples dirty; where deities are placed amidst all prasadam and where rotting flowers are strewn in the pathway -- Manipur teaches us grace and discipline. This culture and tradition is under severe threat and strain by the separatists. They are disconnecting all the threads that bind us together and weave the beautiful fabric of India. This is India. A different India. An India we in the north hardly care to know about. Our India, as my friend and former Editors Guild Chair Dhirendra Nath Bezbaruah once said, with pain in his eyes: "Tarun, your India exists from Vaoshnodevi to Kamakhya, or just Delhi to Kolkata. Beyond that it's a strange land for all of you." I agree. We hardly spend our vacations in the North-East, neither want to share the pains and joys of the people who represent the best of India. Big leaders spend their time where the votes are. Their vacation destinations are elsewhere. For the last decade and more I have been writing on this subject and visiting the farthest places in the North-East. I see things are changing too slowly. People are getting sick of the still waters in the socio-political development in the North-East. What I wrote in 2010 -- Delhi sleeps while Manipur burns, May 17, 2010, followed by other articles till this one on the mothers of Manipur refusing to bury their dead sons -- is still true. In spite of all this, if Manipuris manage to celebrate festivals, we must salute this land of great culture. The land that gave us the world famous Manipuri dance Jagoi, the martial art form Thang Ta, boxer Mary Kom and the Bhakti of Krishna, Rukmini and Yaosang. So, this Holi, book a ticket to Imphal. You will never regret it. Tarun Vijay is a former Bharatiya Janata Party member of the Rajya Sabha. Do women really take the lead in Manipur?